Blog: We drove from Hastings to France for free! BRIAN and Francesca Mitchell from Hastings decided to go on a different kind of summer holiday this year. 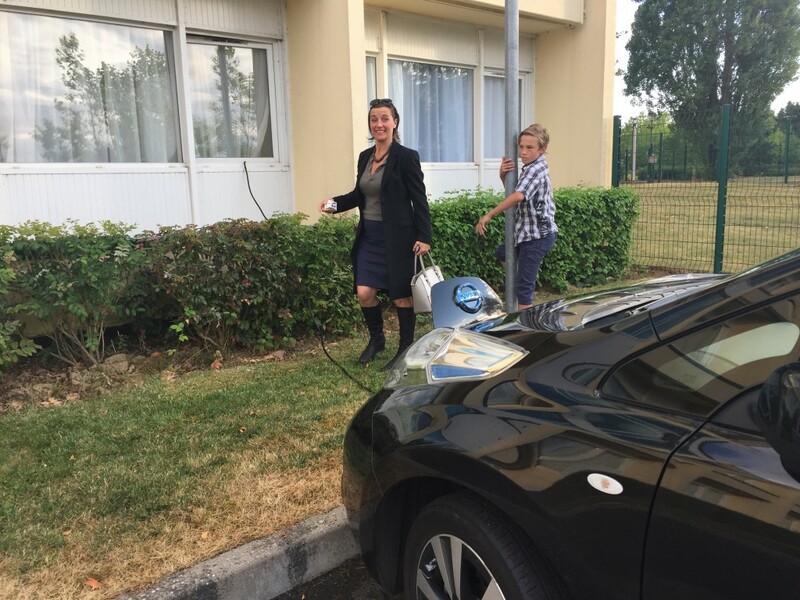 Along with their two children, Nat and Georgie, they took their Nissan LEAF to the south of France to a boat on the River Lot and back. The 1,200-mile round journey cost them absolutely nothing in fuel and turned out to be a really fun adventure for the whole family. Here, they write about the driving experience. Francesca’s story: I have to admit I wasn’t exactly jumping up and down with excitement at the thought of having to take this journey. I’ve never been a great one for the journey itself – I just want to get there. 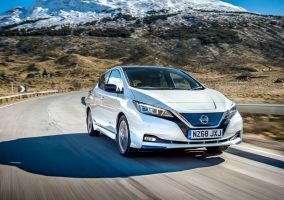 What really excited me was the concept of trying something entirely new, of getting all the way down to the south of France from Sussex without all the spitting out of fumes – and without spending money on petrol! When my husband showed me the phenomenal spreadsheet he’d drawn up of the charging points we’d be using all the way down France (with plan B and C chargers in case the A plan chargers were out of action) and the estimated time it was going to take to cover each leg of the journey going at optimum speed for achieving the 80 miles or so we had to cover between stops – let’s say I didn’t exactly jump up and down with excitement. Despite my fears, it became one of the great things about this summer. I got it, finally – what all those books and films had been banging on about – I got the point of travelling, of the journey. It was great – moving through a country slow enough to see it shifting and changing, to see how people’s gardens changed, the different way they set out the bread in the bakery, the switch from corn to cows, to apples to grape vines and back again all the way down. We appreciated how big France was, how brilliantly empty the roads were. 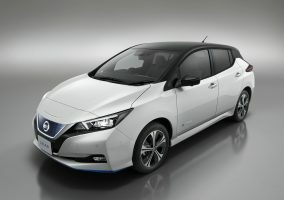 What’s more, with the Leaf’s navigation programme on Eco route taking us through every back road (and practically every back garden!) and market square we gained a real sense of how separate all the bits of France are. It was a real journey and we loved it – my husband and I spent the whole time pointing out wild little sights – hares standing up in the corn, a working wooden windmill, a really good ice cream parlour in the middle of a 15th century town square, two weird towers of Chartres cathedral sticking up like Oz across the miles and miles of flat Normandy corn stubble, a smiling dog wagging at us between the flowers on the balcony, that really good frites van by the bridge, another absurdly straight Roman road, a glimpse of a stunning chateau, another really good frites van, the way the French line their roads with trees like big railings, a massive gold Christ on a church tower, even more ice cream. Even the two slight video addicts in the back of the car got it, most of the expressions of excitement and interest from the kids in the back in response to us two in the front pointing something out were genuine. Brian says: The whole journey was a real success. Pioneering and exciting in the way I imagine driving used to be. It was all down to the planning, though, and I think we may have been just a little bit lucky that everything worked out. 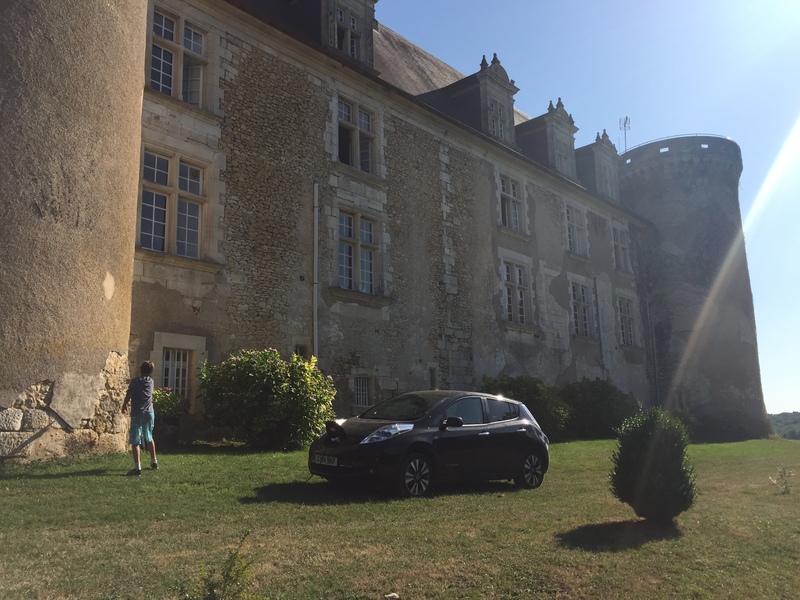 We only ran out of power once – because one of the chargers we had plotted was out of order and we made the wrong decision to go looking for another one nearby with the reserve charge rather than heading straight to the ‘B’ plan, which was the Chateaux we were booked into for the night. We called the international recovery number. They promised a truck within 90 minutes and it arrived exactly an hour and half later and lifted us the short distance to the hotel where, incredibly, the Chateaux owners had kindly said we could unplug the flood lights and plug the LEAF in! In fact everywhere we went people were keen to get involved in helping us to charge: Novotels even ran cables out of rooms for us. There was occasional range anxiety initially but we soon got into the rhythm of the trip and I found that as long as I kept 20 miles or so in reserve I felt OK. We were charging up to five times per leg and the battery did get hot, with the dial drifting into the red towards the end of the day, but the only effect that seemed to have was adding time to the charge. Some of the Chademos would not charge above 90% if the battery was hot. 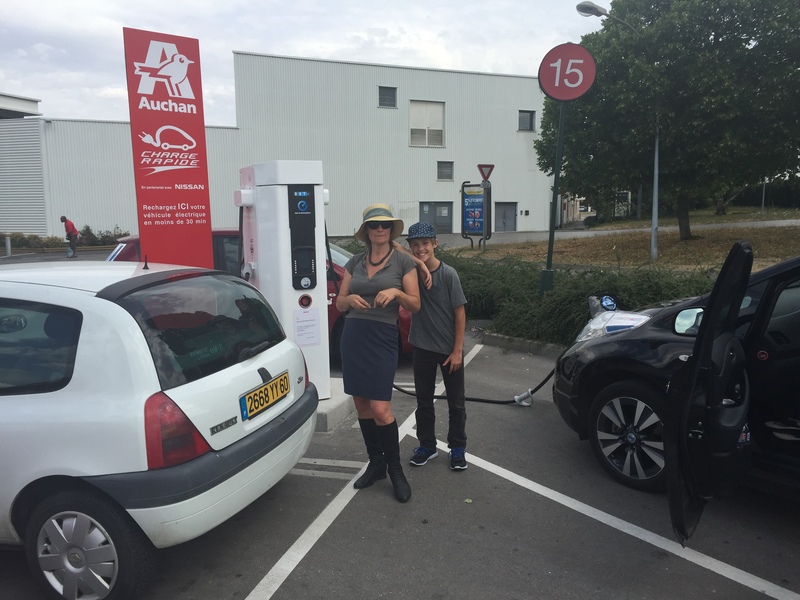 There are 300 Chademos being installed in France at Auchon supermarkets. It will be one of the best networks in Europe. You need a KiWhi pass which we ordered from http://www.kiwhipass.fr/. Nat’s story: My family and I went on a road trip down the centre of France from Calais to near Dordogne. 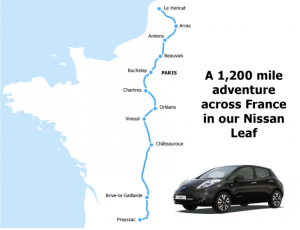 The special thing about the trip was that it was done in the 100% electric LEAF. The whole thing was a great adventure as we got to see tons of Auchans (a French supermaket with electric charging) and we got a lot of ice cream! It was great experience as we saw a lot of cathedrals, although they all looked the same to me! The most important thing is that it was fun and great. Georgie’s story: We sat in the back most of the time. Sometimes if my brother and I argued I got to sit in the front. You can see more from the front but the BOSE music system sounds better in the back. In fact it’s really good! 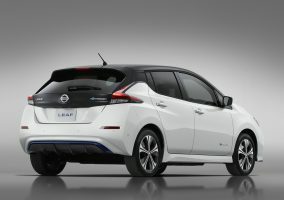 The LEAF trip went so quickly and I got to shop and get ice cream every time we stopped to charge up. Dad also said we had to take very little packing but I got everything I needed into my blue wheelie case. It was great!